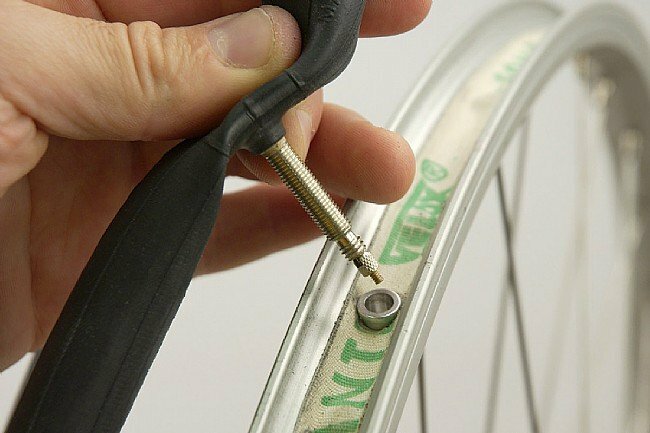 Handy adapters allow you to use Presta valve tubes in your Schrader valve drilled rims. 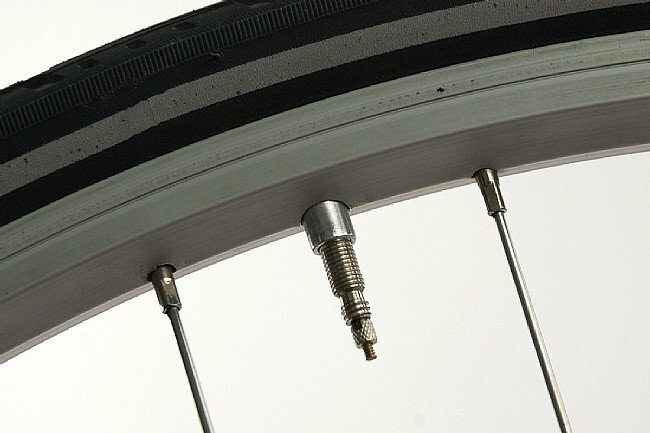 Presta Stem Savers fill the excess space in wider Schrader rim drillings, reducing wear on the smaller diameter Presta valve. Sold in pairs. Great for converting to presta. Work well. They work like they are supposed to. Helps to put a drop of super glue to hold them in place when installing. I've used rubber grommets before, but these are much better. Won't break down or wear out like rubber. Great little doodahs for spacing racks too. Have used these at adapters for Schraeder valves but they're great for adapting touring racks to 120-126 rear triangles and helping to pinch fender bolt tabs to eyelets. These come in two per package, in case that wasn't clear. And they work as promised! I put them in my vintage hook-less rims. Great for smaller size wheels too! I converted my daughters 20 in. bike to Presta using these and now I don't need to worry converting the frame pump on my bike to Schrader. One stem for everybody and one less thing for me to worry about. That's worth the price right there. These do the job, but should be anodized for corrosion protection. I just had to replace a tube after a pinch flat, and could not get the corroded stem saver off the old stem...corrosion was so strong that the stem ripped out of the damaged tube, as I tried to remove the stem saver. I had to limp home with low pressure to prevent the new presta tube from extruding through the Schrader hole. All I have to say is I'm glad I switched to presta valve tubes using these stem savers on my 1979 Takara Sport Road Bicycle, because I use a pair of 28mm Continental Super Sport Plus tires that require a maximum pressure of 115 psi. Not much to say. They do what they are supposed to do. Nothing not to like. Gets the job done, does it well, and doesn't cost much. I see no downside to using these, and I can run the same valve front and rear. Exactally what it says on the tin. They work, and the price ins't too bad, but they could be done better. The rim at the end made too much bulk around the valve hole where the rim tape is already doubled, and the thick stem to tube connection is. I slid the adapters on from the outside, and tightened down the nut on the presta stem to hold it in place. They could stand to be bit longer too. They come shrin wrapped to a card and the plastic is very difficult to get off, I had to scrape it away with a knife. Not bad product, but there's room to iprove. Bought on sale, & wish I had done sooner, even at full price. If you need em, get these. They cost close to nothing and look a lot cleaner then the solutions I've rigged up in the past. I like to carry as little repair tools and supplies as possible when commuting, so its covenient to convert all of my schrader rims to fit all presta pumps and tubes instead of a mix of each kind. These may prevent valve stem blow outs. I was trying to use tubes with schrader valves on my recumbent trike. The front rims are 406 (20) size and my tubes bunched badly inside the tire. Expected lifespan for the tube was short. Presta valve tubes fit my 20 rims much better. Since the tube is thin rubber and air pressure is 90-100 psi, the tube might blow out around the valve stem. The stem saver prevents this. 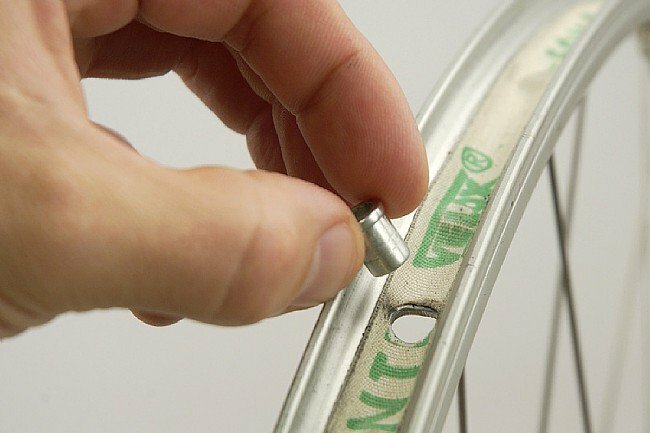 It also holds the Presta valve stem straight during installation so the rubber on the stem can't be cut by the edge of the hole in the rim. This reduces chance of leaks, increases reliability. I got tired of switching my pump from Schrader to Presta all the time - these worked great on my commute bike and now I'm 100% Presta!!!! 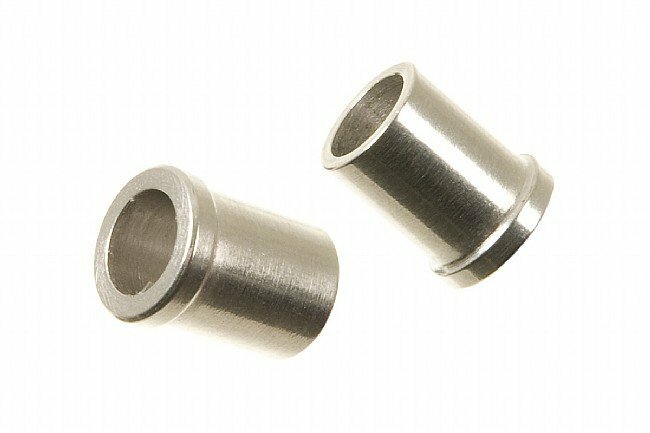 These tiny little bits allow you to run the far superior presta valve on an old (or cheap) wheelset that is drilled for Schrader valves. Other shops will charge you twice the price! I really like this item. By converting my shrader rims to safely accept presta tubes I can standardize and consoladate my inventory of spares tubes. I like these better than the rubber gromet style converter. This would now press through my rim without needing to drill the hole slightly larger, then it was loose? This was on a Araya rim with standard Schrader valves previously. Suprised this was not a closer fit to what I thought was standardized replacementmodification. Could do with being a little longer but other than that they do what they are supposed to do.